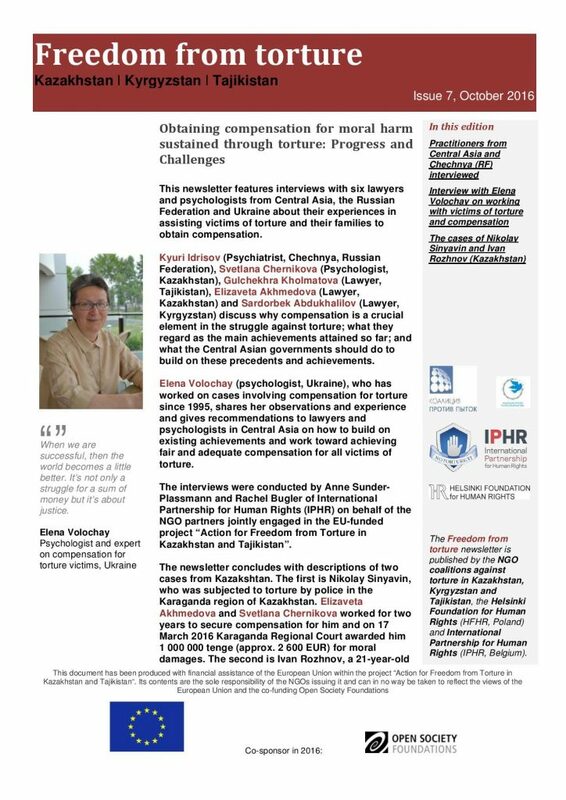 A new newsletter published by the NGO coalitions against torture in Kazakhstan, Kyrgyzstan and Tajikistan, the Helsinki Foundation for Human Rights and International Partnership for Human Rights (IPHR) features interviews with six lawyers and psychologists from Central Asia, the Russian Federation and Ukraine about their experiences in assisting victims of torture and their families to obtain compensation. Kyuri Idrisov (Psychiatrist, Chechnya, Russian Federation), Svetlana Chernikova (Psychologist, Kazakhstan), Gulchekhra Kholmatova (Lawyer, Tajikistan), Elizaveta Akhmedova (Lawyer, Kazakhstan) and Sardorbek Abdukhalilov (Lawyer, Kyrgyzstan) discuss why compensation is a crucial element in the struggle against torture; what they regard as the main achievements attained so far; and what the Central Asian governments should do to build on these precedents and achievements. Elena Volochay (psychologist, Ukraine), who has worked on cases involving compensation for torture since 1995, shares her observations and experience and gives recommendations to lawyers and psychologists in Central Asia on how to build on existing achievements and work toward achieving fair and adequate compensation for all victims of torture. The interviews were conducted by Anne Sunder-Plassmann and Rachel Bugler of IPHR on behalf of the NGO partners jointly engaged in the EU-funded project “Action for Freedom from Torture in Kazakhstan and Tajikistan”. The newsletter also features the descriptions of two recent cases from Kazakshtan concerning reparation for victims of torture. Over the past ten years the Central Asian Anti-Torture Coalitions have pushed for progress in facilitating access to reparation for victims of torture and their families. Thanks to these efforts, six victims or their bereaved families have received compensation payments for moral damages sustained through torture in both Tajikistan and in Kazakhstan. Although the amounts of compensation that the courts ordered the authorities to pay have not been adequate, these are nevertheless important regional precedents. While in Kyrgyzstan the courts have also ruled in favour of compensating victims in several cases, to date none of the victims has actually received payment. In Kyrgyzstan – contrary to the country’s obligations under international human rights law – domestic legislation does not require the state, but the perpetrators, to provide compensation for torture. Coalition members have also provided hundreds of victims with rehabilitation services in recent years, such as medical and psychological support. In not one of the Central Asian states does domestic legislation provide for measures of reparation such as satisfaction and guarantees of non-repetition. This is the seventh Freedom from Torture Newsletter.